Watching online YouTube video on the new iPad 3 is not very convenient due to the bother of slow network connection and buffering. Why not get YouTube video offline on the new iPad 3 and watch them leisurely? Well, you may ask the YouTube videos (FLV videos) cannot be played on the new iPad 3 yet as iPad 3 supports to play videos in MP4 format, not FLV. How to play downloaded YouTube video on the new iPad 3? This article will show you how to download and play YouTube video on the new iPad 3 with a YouTube to iPad 3 video converter, which can download online YouTube videos for free and transcode YouTube videos to iPad 3 video formats for playback. MacX Video Converter Pro is an all in one YouTube video downloader and converter for the new iPad 3 that is able to save videos to iPad 3 from YouTube, Dailymotion, Metacafe, Vimeo and 300 more sites, be it in HD 1080P/720P, 4K/8K UHD and then encode the downloaded YouTube videos to the appropriate format for playing on the new iPad 3, iPad Air 2/Pro/mini 4 and many more devices with the world's fastest speed. Note: You can join the New Year's saving at Giveaway Page to win free MacX Video Converter Pro (both Mac and Windows version). Best iPad 3 YouTube video converter to free download/process 4K/HD 1080P/720P, UHD 2160P videos from YouTube to iPad 3 (iPad Pro/Air 2/mini 4 etc), fast speed and excellent quality! 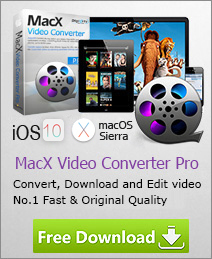 MacX Video Converter Pro is good at converting video in any format for playback on iPad/3, iPhone/X/8/7, Android, as well as downloading video from YouTube, Vimeo, Myspace, Metacafe etc. Let's take a look at how to download and play YouTube video on the new iPad 3 with fast speed and good quality. First of all, you need to free downlaod the iPad 3 YouTube downloader on you computer. You can get the Mac (El Capitan) or Windows (Windows 10) version as you need. Click "YouTube" button, copy and paste the URL of the video in the box. The converting feature will associate with this YouTube video downloader, which also can be used to encode YouTube video to iPad 3 for free. After entered the URL in the box, choose the format you want, such as YouTube to iPad, YouTube to MOV, YouTube to MP4 etc. Choose iPad as your output format, or you can choose a video format supported by iPad such as MP4, MOV etc. Besides, you can choose other devices, like iPhone X/8/7/6S/6S Plus, Samsung Galaxy S9 etc as you need. Now you can successfully play your favorite video on your new iPad 3 without network restriction by using this YouTube to iPad 3 video converter. Moreover, this YouTube to iPad 3 download/converter also provides you flexible output controls such as Bit Rate, Frame Rate, Aspect Ratio, Sample Rate, stretch to full screen, clip video segment, remove subtitle to customize personalized video files. Wanna to download movies to iPad to enjoy some movies, TV shows, and music on your iPad in your free time? Here a simple guide on how to download movies on iPad (iPad Pro/Mini 4 included) is shared with you.